Nuclear power (NYSEARCA:NLR) is the best option for clean base-load power generation, according to Gold Stock Trades editor Jeb Handwerger. As proof, he points to signs that even environmentalists are beginning to favor it. Meanwhile, uranium stocks (NYSEARCA:URA) are rising and large nuclear construction programs overseas should keep upward pressure on them. But as Handwerger explains in thisinterview with The Energy Report, the future of nuclear power generation may lie with small modular reactors, and the U.S. is leading their development. The Energy Report: Jeb, natural gas prices have become soft again after reaching $4.25 per million Btu ($4.25/MMBtu) last spring. They’re now back at $3.70/MMBtu. What gives you confidence that nuclear power will continue to have a competitive edge over gas for power generation? Jeb Handwerger: Natural gas has backed off its highs a bit, but it’s still much higher than its low of $2/MMBtu. Oil and natural gas have made strong upward moves since 2012. Oil is above $107 per barrel. Uranium is still cheap; it’s at multiyear lows. An uptick in accumulation of the cheaper uranium from large utilities could be the catalyst for a major repricing higher. The price of uranium historically tracks oil, and right now it is an opportunity for utilities and investors to buy cleaner and cheaper uranium. At the end of the day, with nuclear specifically, a shift is occurring even among staunch environmentalists. Japan and Germany initially moved away from nuclear, but now they’re coming back because they’re realizing, as the environmentalists are realizing, that moving away from nuclear causes demand for fossil fuels—coal and natural gas and oil—to rise. Nuclear is the only thing that can stop that rising demand. It’s the only major base-load power that’s clean. Countries that use fossil fuels heavily, especially India and China, are dealing with debilitating air pollution, and nuclear power can play a transformational role, environmentally and economically. Governments around the world, including the U.S., have been discussing policies in air pollution and the climate crisis. I believe that over the next generation, say, 20 years, nuclear will be the source that’s going to see exceptional growth because it’s able to provide an additional major supply of power and it does not hurt the atmosphere. Environmentalists are realizing that renewables alone are unable to fill the gap left by halting the use of fossil fuels. This is highlighted most recently in a documentary that won many awards at the Sundance Festival, “Pandora’s Promise,” which explores the transformation of antinuclear environmentalists into believers in the benefits of nuclear power. Nuclear power is getting investment from countries around the world, and it’s attracting the attention of influential people like Bill Gates, who believes in the future of the next-generation nuclear technologies. TER: Could the focus on clean energy help the push for nuclear power? JH: Yes, combined with rising oil prices and rising natural gas prices, which we’re seeing, this is going to push discussion of energy sources that are cleaner and safer for the environment. Just recently in the news, there was a major accident in Québec with oil being transported by rail. At least 42 people were killed, and five more are missing and presumed dead. There are deaths every year from the fossil fuel industries. There has not been one death from Fukushima. Not only that, but the move away from nuclear in Germany and Japan has caused a major increase in carbon emissions. Nuclear is going to get a lot of support, and the development of the next-generation nuclear technologies that people like Gates are investing in may be an area where investors at this stage could get in on exceptional growth. TER: Will the increased U.S. demand from planned expansion of reactors by Georgia Power Co., a subsidiary of Southern Co. (SO:NYSE), and others, and proposed development of small modular reactors, make a difference in the global supply and demand picture, or will China, India and Russia play a larger role? JH: One of the areas where the U.S. for decades has been the leading technological power is in small nuclear reactors. We’ve used them on our aircraft carriers and on our nuclear submarines safely and efficiently. The U.S. has an advantage in understanding small modular nuclear reactors. One of the companies that we have followed for a long time that’s working on that is Babcock & Wilcox Co. (BWC:NYSE). There’s also Fluor Corp. (FLR:NYSE), which is working on small modular nuclear reactors. President Obama and the Department of Energy are funding research on the implementation of small modular nuclear reactors. The reality is that the U.S. is the largest consumer of nuclear energy. Twenty percent of our power comes from nuclear, 55 million pounds a year (55 Mlb/year) of uranium. China only gets about 2% from nuclear. Over the next generation, this could rise exponentially. China is not going to get anywhere close to the U.S. demand of 20%, but uranium demand will increase exponentially, which will require new uranium mines to go into production over the next decade. If these nuclear plants don’t come online in a timely manner, China and India are going to be dealing with worse and worse air pollution. Cities like Beijing are dealing with blackened air. It’s a real crisis. They’re already setting standards over the next decade to reduce emissions. They’re going to need nuclear plants or else there are going to be more and more people dying every year from these air pollutants. Russia’s also making a huge push. Rosatom State Atomic Energy Corp. recently became the primary shareholder for Uranium One Inc. (UUU:TSX). The U.S. Department of Energy also has awarded major grants to foster research for small modular nuclear reactors. This could transform the industry because a major hurdle has always been the immense capital costs in building large nuclear power plants. The small reactors could be a more affordable option in areas that don’t need much power or in more remote areas. It could change the limits of what is possible in this sector. TER: Only three reactors are being built right now in the United States, and some reactors are being retired, so the total number is beginning to slip. What will be the effect if some of those projects in the U.S. now under construction don’t come online in the near future? JH: The U.S. consumes about 55 Mlb/year of uranium and only produces 4 Mlb/year. Even if some of the old reactors are retired, the U.S. is still in a major deficit for uranium supply. There needs to be a supply for next-generation reactors that are safer, securer and more reliable. That’s why I’ve told my subscribers to look at the nuclear services industry. Many of the old plants will need to be either scrapped or updated. Next-generation designs will usher in an area of growth for nuclear manufacturers and power providers. TER: What are the prospects for uranium mining in the U.S.? What companies could mitigate the U.S. demand for imported uranium? JH: There are several companies that are in production that we follow in the U.S., such as Cameco Corp. (NYSE:CCJ). Cameco produces at the Smith Ranch-Highland in the Powder River Basin. There’s Uranium One, also in the Powder River Basin. There’s Uranium Energy Corp. (UEC:NYSE.MKT) and there’s Energy Fuels Inc. (EFR:TSX; EFRFF:OTCQX), which just acquired Strathmore Minerals Corp. (STM:TSX; STHJF:OTCQX). A few near-term producers are rapidly coming online. Ur-Energy Inc. (URE:TSX; URG:NYSE.MKT) and Uranerz Energy Corp. (URZ:TSX; URZ:NYSE.MKT) are companies we like in Wyoming. I’m focused on Uranerz right now, as I believe it is undervalued for the strategic land position it has. Uranerz is in the construction phase of its Nichols Ranch project in the Powder River Basin. I like the company because it already has agreements with two major utilities. Uranerz is going to take out its resin and transport it to Smith Ranch-Highland, where Cameco’s going to process it. 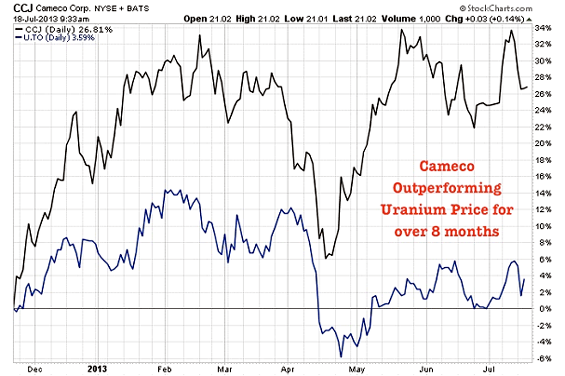 Uranerz has a strategic position between Cameco and Uranium One. And I think that Cameco is going to look to expand in the U.S.
TER: What are Europe’s prospects for domestic supply? JH: Right now, there is one operating mine in the Czech Republic. Europe is the largest per-capita user of nuclear power. The European Union (EU) has 160 nuclear reactors but only one operating mine. AREVA SA (AREVA:EPA), the nuclear giant from France, gets a lot of its supply from Niger. We saw an example of the political risk in that area when AREVA’s mine became the target of a suicide bombing and was shut down. There may be some increased attraction for potential development projects in the EU. The one junior that we know is at the feasibility stage and that has AREVA as a major shareholder is European Uranium Resources Ltd. (EUU:TSX.V; TGP:FSE; EUUNF:OTCQX), which has a memorandum of understanding with the Slovakia government and is advancing the Kuriskova project, which is one of the highest-grade uranium deposits in the world. TER: What other uranium companies do you like? JH: The Athabasca Basin has the highest-grade uranium mines in the world. If you’re a momentum investor in the resource sector and you want to follow an exciting discovery, you’ve got to watch the success of theAlpha Minerals Inc. (AMW:TSX.V) and Fission Uranium Corp. (FCU:TSX.V) discovery in the western part of the Athabasca Basin. This is one of the most incredible discoveries in the history of the Athabasca Basin. These are some of the few stocks in major up-trends, while the resource market has been generally weak. We’re in a difficult time in the resource sector. These are stocks that have really bullish charts and are consistently putting out great news. It’s getting on the radar of a lot of investors. It’s creating a whole uranium rush, and other juniors are coming into the west side of the Athabasca Basin, where this discovery was made. I am watching some other smaller exploration plays in the Athabasca Basin with a lot of potential and that may be positioned to piggyback on the Fission-Alpha success, such as Athabasca Uranium Inc. (UAX:TSX.V; ATURF:OTCQX) and Lakeland Resources Inc. (LK:TSX.V). The uranium price has been flat, around $40 per pound ($40/lb), yet we’re beginning to see uranium miners in a significant up-trend. Cameco is up 30% since November 2012. Alpha Minerals is up almost $4/share. When you start seeing capital flowing into the miners, that means people are anticipating a turnaround in the uranium price and uranium demand. TER: You predicted a strong rebound for uranium back in your October interview with The Energy Report.Why hasn’t that occurred? JH: We have not seen a rebound in the price of uranium, but we expect that to happen very soon because Japanese utilities just applied to restart 12 reactors. That’s huge. We think that Germany is going to move back from the knee-jerk reaction of Chancellor Angela Merkel. Electricity costs are skyrocketing there. We see much more expansion of nuclear in emerging economies. TER: What uranium miners are looking for acquisitions, and who is or could be for sale? JH: We’re beginning to see more mergers and acquisitions (M&A). We had the Denison Mines Corp. (DML:TSX; DNN:NYSE.MKT)/Fission Energy deal on the J-Zone near the Roughrider deposit last April. You have Energy Fuels and Strathmore. We think that Cameco and the large guys are going to look to build their growth in the U.S., so don’t be surprised if Cameco picks up some junior uranium miners that are nearing production, such as Uranerz. Then you have the European situation. European Uranium is really a critical potential supply for the EU. So that company should attract acquirers. Keep a close eye on Elliot Lake, Ontario, which produced uranium for a generation. Although it is lower grade than the Athabasca Basin, the mines could be economic with rising uranium and rare earth prices. Rio Algom produced uranium and heavy rare earths there back in the 1980s. The mines were shut down when uranium went below $15/lb and rare earths were relatively unknown. Well now it is a completely different story, uranium could hit $90/lb by 2016, according to JP Morgan, and rare earths are growing increasingly in demand for clean energy applications. Watch Pele Mountain Resources Inc. (GEM:TSX.V), which is advancing the Eco-Ridge uranium-rare earth project toward feasibility. Strategic partners may see the benefit of having the rare earths and scandium as a byproduct. TER: Agriculture benefits from some of the same global growth factors as energy. You’ve encouraged investors to look for exposure to potash. Where should they look, and why? JH: Potash is completely off the radar for most investors in the West right now, but investors from the East are really excited about potash. Potash has been hit pretty hard since the global credit crisis and it’s been basing for a while, but potash is critical for emerging economies that have rising populations that need better quality food. Most of the supply is controlled by just a few companies, which control the pricing. The large consumers from the East want to secure their own supply. They realize what a great business potash is, so why not go out and work with some of these junior miners and secure offtake agreements? If demand increases rapidly, the majors may choose not to boost mine output. So the new potash deposits may be really critical to some countries. We’re already seeing some of them making strategic investments. A Chinese fund just invested in two ofZimtu Capital Corp.’s (ZC:TSX.V) major holdings, Western Potash Corp. (WPX:TSX.V) and Pacific Potash Corp. (PP:TSZ.V). We’ve seen an Indian fund coming into Karnalyte Resources Inc. (KRN:TSX). We’re seeing some of the smarter money coming in to invest, and this may be a catalyst to reawaken investors to the undervaluation of these junior developers. Most people don’t realize that India spends more on potash and fertilizer every year than it does on national security. One of the areas that I think that investors should look to for great leverage is Passport Potash Inc. (PPI:TSX.V; PPRTF:OTCQX). Share prices are really undervalued right now. It could be a ten-bagger if we have anything similar to the 2010 or 2007 potash rally. We think that it could have a really good rally if it isn’t bought out beforehand by Indian or Chinese consumers. Passport recently issued a preliminary economic assessment (PEA) that showed an NPV of over $3.25 billion. It’s pretty remarkable, considering the company has a market cap of less than $35 million. Despite this, it’s overall a weak market and investors are able to pick up Passport very cheaply. We expect Passport to meet with end-users and show them that the Holbrook Basin project is economic. Passport has made some great advances recently. It has hired a new chief operating officer who had over 21 years of experience with PotashCorp. (POT:TSX; POT:NYSE). Passport has announced new strategic land holdings. It is making advancements on permitting. This is a company that I think is very undervalued and has great potential. TER: You mentioned that Chinese investors were looking at Western Potash and Pacific Potash. China and the U.S. have begun working on a proposed bilateral investment treaty. If the Chinese were to invest in the U.S. potash sector as a result of that treaty, how would that affect the potash space? JH: It could mean better access to capital for junior companies. Capex for potash projects is large. The total U.S. production of potash right now is about 1 million tons per year (1 Mtpa), but the U.S. consumes close to 10 Mtpa, so a lot of that is imported. Companies like Passport and the other names highlighted above could really help alleviate that supply shortfall. With inflation combined with these fundamentals of increasing demand, we think that food prices are going to go higher and potash is a way to hedge against inflation and food price spikes. TER: What effect would the increased Chinese presence in the market have on stock prices of potash producers? JH: The biggest key is financially derisking these assets. Investors want to know if companies have enough money to go to the feasibility study stage and into construction. As soon as those questions get answered, it could be a huge catalyst to share prices. TER: Do you have any final advice for energy investors positioning themselves for the rest of 2013? JH: We are going into a phase that could be very bullish for energy investors. We are going from an economy that was slowing to one that’s expanding. Geopolitical tensions in the Middle East and North Africa and throughout the world could have a significant impact on energy prices. Even though precious-metal prices have been basing, there’s been this rotation into energy. This is a time where savvy investors can get into situations at a very cheap price before an inflationary cycle that could see exceptional gains in the commodities and the energy sector. 2) The following companies mentioned in the interview are sponsors of The Energy Report: Energy Fuels Inc., European Uranium Resources Ltd., Fission Uranium Corp., Uranerz Energy Corp., Strathmore Minerals Corp. and Passport Potash Inc. Streetwise Reports does not accept stock in exchange for its services or as sponsorship payment. 3) Jeb Handwerger: I or my family owns shares of the following companies mentioned in this interview: Zimtu Capital, Energy Fuels Inc., Ur-Energy Inc., Uranerz Energy Corp., European Uranium Resources Ltd., Athabasca Uranium, Denison Mines Corp., Pele Mountain Resources and Passport Potash Inc. I personally am or my family is paid by the following companies mentioned in this interview: None. My company has a financial relationship with the following companies mentioned in this interview as these companies are sponsors on my website: Zimtu Capital, Uranerz Energy Corp., Pele Mountain Resources, Passport Potash Inc. I was not paid by Streetwise Reports for participating in this interview. Comments and opinions expressed are my own comments and opinions. I had the opportunity to review the interview for accuracy as of the date of the interview and am responsible for the content of the interview. 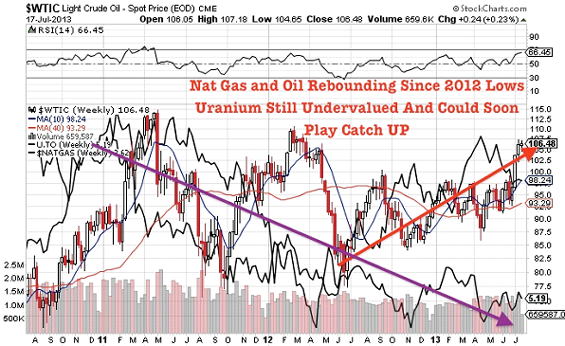 Major Bottom Reversal Follow Through in Junior Gold Miners (GDXJ) and Uranium Miners (URA)? Great work on the reasons to own ppoerrty, especially in Saskatchewan. We can look forward to a few decades of strong ppoerrty values and continued capital appreciation. There has never been a bad time to own properly researched and properly chosen real estate. It is the investment that has always delivered and stood the test of time. 'Love your blog. Great work and very worthwhile and thought provoking articles. Look forward to future articles.